Here’s a fun fact about me: I have 245 LinkedIn invites that I haven’t accepted yet. You may wonder if I’m connected with anyone on LinkedIn with a number that high, however, as of this moment, I have 623 LinkedIn connections. This means that roughly 28% of my invites (not factoring in people that I’ve invited), are still awaiting a response from me. If your invites look anything like the one above, keep reading. My original policy for accepting invitations was that I would only connect with people on LinkedIn that I’ve met at least once, preferably face to face. I’ve expanded that a bit to people that I’ve had virtual conversations with in LinkedIn groups or other social media, or people with whom it would be mutually beneficial to connect with. Everyone has their own criteria for sending or accepting LinkedIn invites, and that’s fine, but there are some general guidelines to follow that will greatly increase your chances of an invite being accepted (especially by me). Actually, I think I may share this article with the 245 invites that I’ve yet to accept. Connect only with people you’ve actually met before or that you have some prior relationship with. An exception might be if you have a legitimate job offer for someone. Make sure you’re connecting with who you think you’re connecting with. Sounds silly, yet there are 222 people named Emily Carpenter on LinkedIn, and four of them in Rochester NY. I’m sure that a few of my unaccepted invites are intended for a different Emily Carpenter. Check pictures and profile information before hitting “Send Invitation” just in case. Study their profile first and see what you have in common. Go to any links they’ve provided on their profile, such as to a company website or social media profile and learn about them. Avoid auto-invites like the plague (pictured below). In other words, don’t send invites to all 3,000 of your Gmail contacts. It’s called SPAM, and most people don’t like to receive it. If you do accidentally send an auto-invite, follow it up with a personal note explaining specifically why you’d like to connect with a particular person. ALWAYS include a personal note with your invitation. Put that homework to use, and comment on something that will catch their attention. Send the invite soon after meeting someone as extra insurance that they will remember you. Going through a stack of business cards and inviting everyone you met in the past year is a sure way that people will not remember you. Invite them while you are still fresh in their mind. Start a conversation by sending them a personal note thanking them for connecting and commenting on something currently going on in their world (see #2 and #3 above for some ideas about what to talk about). If you don’t know the person sending the invite, write a note back asking for them to remind you how they know you. Periodically go through your list of connections, and reach out to people that stand out for you. Ask them how things are going, or tell them about something they may find interesting. You might even invite them out for coffee. Post to groups and update your status on a regular basis so that you will stay top of mind for each of your connections. Make notes on your connection so that you can refer back to important details the next time you speak with them. 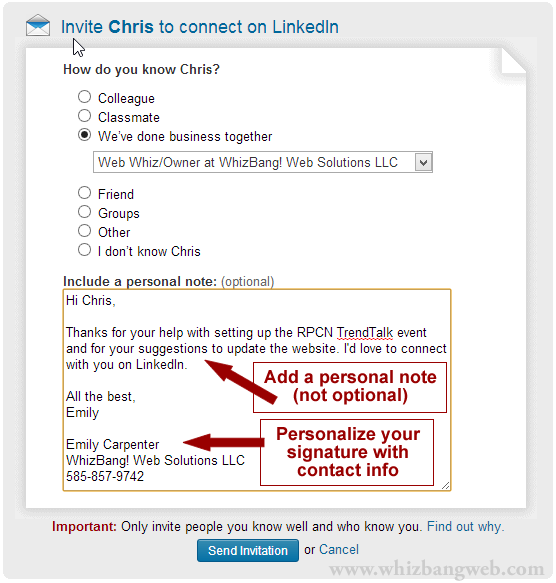 LinkedIn gives you a space to do this, however, put your notes in any contact manager that you use regularly. I use Google contacts for this because I can then easily access the info from my phone as well. What are your criteria for accepting LinkedIn invitations? Share your guidelines in the comments below. Anyways, i wanted to congratulate you on a post well written. It really gives in a nutshell the 101 on how to reach out to people on LI. The personal meetings and inviting them out for coffee is too much for my taste – i live and breathe online these, days… especially since i freelance and work with people all over the world, it would be literally impossible to meet personally even half of my connections. Great post – sharing it on social media, too! Great posts. I’m always charmed when someone takes the time to talk to me in their link request. LinkedIn itself creates the pitfalls by taking you to a set up where you don’t have a choice in what will be said in the link request and most people (I plead guilty) won’t take the time to correct it with a follow up. As with any networking, you grow from people you know. Accepting invitations just for the heck of it is not helping build your network. I do agree that viewing a profile prior to accepting an invitation is vital. I want to know who I am connecting with. If I connect with the wrong people it may reflect on my poorly. I’ve had that experience too when you think you’re going to be taken to a screen where you can send a personal note, but then it auto-sends an invite with no option to personalize. It’s so important to follow up, although I do wish that LinkedIn would always allow you to tailor your invites. I seem to be getting more of them too, four more since I published this post. I have trouble meeting people out for coffee too, so try to make myself available via phone and email as much as possible.